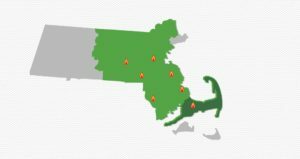 Our service area spans across all of Eastern Massachusetts, Northern Rhode Island, Southern New Hampshire and Central Massachusetts including Worcester. Wherever you live, we have local offices with friendly customer service professionals ready to serve you, and a fleet of fuel delivery trucks and service vans at the ready when you need us. We pride ourselves in providing personalized attention and fast local response. From full-service home heating oil delivery, heating system service and installation, air conditioning, and preventative maintenance, we pride ourselves in providing personalized attention and fast, local response. We also offer a number of flexible payment options to suit your needs. We are excited to announce Fawcett Energy and Worcester-based Noar’s Oil have joined forces recently to add Worcester and the surrounding communities of Auburn, Boylston, Charlton, Grafton, Holden, Leicester, Millbury, Northborough, Oxford, Paxton, Princeton, Rutland, Shrewsbury, Spencer, Sterling, Sutton, Webster, West Boylston, Oakdale and Westborough to our service area. Interested in becoming a customer of Fawcett Energy or our Cape Cod affiliate Scudder Taylor Fuel? Contact us today!